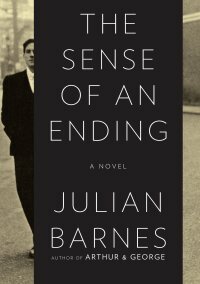 We read Julian Barnes' The Sense of an Ending (Borzoi Books) for my book club this month. I expected to hate it. I had read a lot about it since it was up for the Booker Prize (Spoiler: It won) and it just didn't sound like my bag. But I did end up enjoying the book. It made me think about things I've never thought about before. The book is about a man who revisits his past later in life. He remarks that as he gets older there are fewer witnesses to his life left. I never thought about this. I guess my sisters and my husband are the most important witnesses to my life. Our collective memory is what I rely on. The man in this book has a major change in perspective as he looks back on his life with new information. He talks about how as you age you expect to get old and have friends die but you don't expect to have anything drastic happen which changes your past in retrospect. Getting older makes you more compassionate, I think. So even just looking back on teachers I hated, for example, is fraught with realizations that I misread situations and misjudged people--which is to say nothing about reinterpreting bigger events such as my parents' divorce, for example. I've been married more than twice as long as my parents were married, which shocks me. It shocks me that such a relative blip shaped my life so much. Of course being married myself and having my own children makes the prospect of a divorce and the possible estrangement from my children seem hideous and unthinkable. So much of what I remember is just water under the bridge but other things are newly painful. When I read this book I remembered a girl I went to grade school with. She was really pigeon toed--it was some kind of disability. Everyone was so mean to her and made fun of her constantly. I never thought of myself as a cruel child. I don't think I bullied her. But I know I made fun of her with my friends probably every day. I remember how I regarded her at the time--almost not like a human at all. When I try to remember her, what I picture in my mind is more like a cartoon of some weirdish freak. I thought of her like that then and it's horrible. She was just a little girl. She was someone's little girl. And speaking of weirdish freaks, one time in second grade I sneezed into my hands on the rug during story time. My hands were full of snot. I couldn't move them or do anything so I just sat there because I was a very shy, weirdish freak. A very nice girl asked me if I needed to go to the bathroom for a kleenex. I nodded and she asked the teacher for me. But you see, I hated that girl before and even after that experience. In my mind she was my frenemy. Only as an adult have I realized that I should have liked her for helping me and also that the reason she was well-liked ("popular") was because she was a nice girl who helped people immobilized by handfuls of mucous. I don't know. You rationalize what you do and when you step back from it, sometimes it's embarrassing and even shameful. The haunting thing is that I'm sure I am currently doing things based on misunderstandings which I will misremember and then regret thirty years from now. The Sense of an Ending is kind of stodgy and the narrator is not necessarily a likable bloke but, as you can see, neither am I. It's really short. Maybe it didn't "deserve" to win the Booker Prize. But maybe I didn't deserve to win that poster contest in 4th grade during dental hygiene week for my slogan, "You don't have to brush all your teeth, just the ones you want to keep." I was proud of that win. It was such a coup for an underdog like me. But the truth is, my mom told me that slogan. And she'd seen it on a poster where she worked, which was a dentist's office. In elementary school, I won a limerick contest about water conservation. Mine was "There once was a man from Blip, who let his faucet drip. It dripped all day, from August to May, until his money was zip." It took me about five seconds to come up with, and I won $25. I wish life was always that easy. I rely on your memory a great deal. I like this post. I have been thinking of my memory keepers, because what if they remember incorrectly? How do we preserve any memories? Why do we remember what we do? Last night I was talking with my family and my dad brought up this time where a flood (literally) of frogs came up I-80 and we had to drive over them and it was gross and exciting. I hadn't thought of that for, probably over 25 years. Then, there it was, that memory came back to me. And then my know-it-all brother corrected him and said, "Actually, they were toads." Blech. Some memory keepers are annoying. My husband is obsessed (that was overdramatic) with the importance of perspective. He is a psychotherapist, and can't get over how little emphasis is put on perspective in counseling. It is a hot topic at our house. I would like to say that my abnormally in-depth education on perspective has helped me be a better person; to be more thoughtful. It hasn't. It has only made me realize as I do something horrendous that I WILL regret it eventually. And then to do it anyway. I am painfully embarrassed when I remember a vague outline of how I acted toward a BYU professor whom I thought had wronged me. I don't even remember his name. I think I blocked it out. If I did I might be tempted to send him a letter of apology. Not that he'd remember me. I don't even really remember what the tiff was about but I know it was minor and it had to do with me suggesting to him that he change his teaching style (essentially to suit me better). I can't believe it even as I am writing it, but it happened. I do remember crying in his office, and then a few days later he gave me an apology card that had a gift certificate to the BYU bookstore in it. I want to think I apologized to him too. I have no idea. Memory is so strange. Ouch, I regret that one. And countless others. Or maybe I don't fully regret it, since I did learn from it. Oh, man. Jennifer Hardy again? My older sister says that maybe one of the worst parts of getting older is that you stay up nights remembering and regretting. Yet another menopausal joy to look forward to. I'm hoping she's just getting hyper-self-critical and that I will not go through this phase but I can already see the beginnings of it creeping in.